Time for that Spring makeover for your home but you don’t want to burn a hole in your pockets? Let us introduce you to Freedom Tree’s new collection, called Here Is Now that best describes joie de vivre & summer vibes. We’ve already got our home makeover list ready, read on to know what they have in store for you. Freedom Tree, located across multiple locations in Mumbai & Goa is the place for those who want 'easy, relaxed' homes. With signature color palettes, strong print direction, quirky curated product mix, they bring in offbeat and inspiring design for everyday living. They work with artisans and manufacturers locally and all over India with a range of traditional and modern materials to co-create our hand-crafted design-products for you. The Here Is Now collection is an exclusive Spring-Summer edit that captures the promise of new beginnings and embracing the feeling of living in the moment! A vivacious mix of bold florals, flowing brushstrokes and striper patterns make this collection. 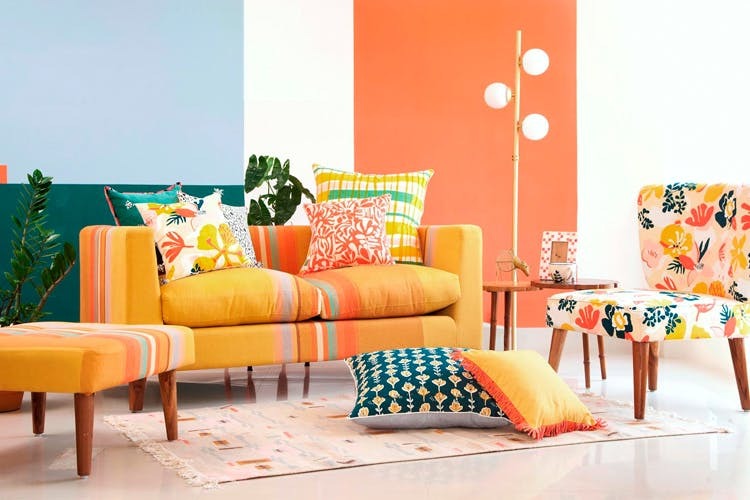 The fresh colour combinations and quirky prints on upholstery, curtains, cushions, bedcovers, dohars, and rugs is what you exactly need this summer. Did we mention that they have also launched a new range of ceramic dinnerware called Mohur, that also has snack and tea-time servers, and decorative vases? Hand painted organic strokes in soft pink and grey gleaming playfully are set to make everyday moments memorable. #HomeGoals right there, guys! This spring-summer collection will definitely get you spoilt for choices. If you happen to visit their Mahalakshmi outlet, they have an option of consultation service which will help you design your perfect home with - from trend advisory and styling guides to compelling color combinations. Visit their website for information. Follow them on Facebook, Instagram & Twitter to stay updated about their many updates.